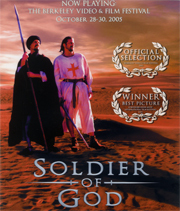 A Knight Templar finds himself alone and hallucinating in the desert - separated from his army. He meets a mysterious stranger - and together they journey to a tragic fate. Two American roommates have their lives changed by a pair of beautiful foreigners in this romantic comedy with an international perspective. 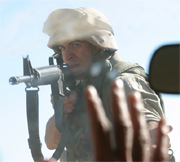 An Iraqi-American Marine returns to Iraq to redeem his place of birth only to destroy the People he hoped to save. A Building inspector brought to investigate a Japanese restaurant becomes embroiled in a blackmail plot by the owner and his wife. Coincidence proves ironic when Sonny Di Luzzia succumbs to a twist in fate. 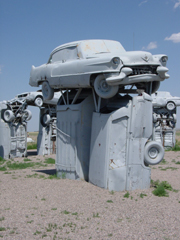 Carhenge is a to-scale replica of Stonehenge made out of junked cars. This is the story of how it came to be and what obstacles the creator, Jim Reinders, faced along the way. "One Man's Treasure" examines Syrian-American peddlers in Boston as junque passion becomes obsession becomes demolition. Sanford & Son redux Middle Eastern. A secretive woman's intimate relationship to her brother is threatened when an unexpected guest shows up for dinner at their eccentric mother's house. A young couple of Tokyo is "strolling along" in their neighborhood. In modern days, young people are afraid to get into serious relationships. This is a vivid film about a focus that modern Japanese society possesses within and is a fanciful love story in new and realistic Docudrama style. A self-centered journalist, who thinks he can do everything by himself, starts to see something important in life when he is sent to San Francisco. It is a film about trust and hope. "Contend" is about a man who fights no-holds-barred events and has to overcome his own fears in order to become the best fighter. Parallel to it, he goes through a difficult relationship with his wife because of his unusual profession. A woman's near death experience results in her life flashing before her eyes in a rhythmic and musical sequence, which chronologically connects simple past experiences to her present encounter with danger. In 1970, Zack and Rico are called in for the Vietnam draft and must choose between serving and a hilarious plan to fail their physicals. "Snafu" is a dark comedy about a college student who tries to be a hero by saving peers from his own fatal traps. The story of a Japanese American couple whose shattered dreams and forsaken loyalties lead them to renounce their American citizenship while held in separate American prison camps during World War II. Five remarkable Native American activists dedicated to protecting their lands against environmental hazards, preserving their sovereignty and ensuring the cultural survival of their people. Avant-Garde artists and clubland VJ's tell the story of live video art over the last 30 years. The Oakland Raiders fans have a reputation of being as violent and dangerous as the football team they love. "Beyond the Wall" explores important parallels between infringements upon own civil liberties in the 1960s and today; examining the constitutionality of the USA PATRIOT ACT. 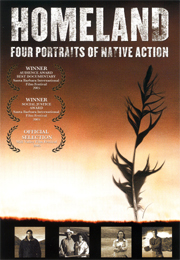 Based on the 1925 "Nation" prize-winning poem by Eli Siegel, this dramatic montage shows how a hot afternoon in Montana is related to the whole world. The glimpse into the personalities, colors and moods of sound that comprise the deep but elusive essence that is Capoeira, experienced through its music. A western-themed, sepia-toned embellishment on Los Angeles based quintet "You Me and Iowa's" single, highlighted by a single, continuous, uninterrupted steadicam shot. This video aims at subtle connections between music and image: one goal is to bring new improvised music to a wider audience. Clothes make the man - or in this case - the boy, in this superhero Cinderella story. A lone puppet descends into a fantastical nightmare world where inorganic manifestations rule supreme. This animated short produced in MAYA features a bee finding his wings among a colorful landscape of bubbles & flowering plants. The city has a unique energy that surrounds everything within in it. As we move through the streets, the energy becomes a part of us just we become part of the urban environment. My battle with Dell as the world went to hell. Based on The Pillow Book of Sei Shonagon written in Japan in the 10th century, the juxtaposition of the ancient Japanese text and culture with the contemporary provides striking parallels between the ancient and modern human condition. Experimental movie created in After Effects with hundreds of talking heads. Spirit of Chaplin & Keaton movies, a young man follows a business woman who accidentally left ninety dollars in his restaurant. Today, the major threat to the polar bear is global warming. Arctic ice is receding at an alarming rate, reducing the hunting season of the world's largest land predator. After receiving his first "B", Harvard-set Anthony is forced to question his priorities as his dreams literally go up in flames. And everyone sings. Non-narrative visual poetry about rain. A young man's obsession for a woman in a painting turns his world upside down forcing him to choose between fantasy, reality, obsession and love. When an alien being crash lands on the remote location of the latest "reality" show, sinister agents from the Project Blue Book arrive to restore order by any means necessary. This film is an action packed, thrill ride parody of the sci-fi/action film genre. A lonely king forces Jesters to dance before him and finds the key to laughter is locked within a forbidden chest. Walter has decided to put his ailing wife in a nursing home. On the day she is leaving, he must make her understand his actions. The disconnected nature of American society and the beauty of connection. Inspired by photography artist Nen Goldin and performance artist Vanessa Beecroft. A rhythmic piece featuring a capoeira performance by "The Capoeira Arts Cafe" of Berkeley. 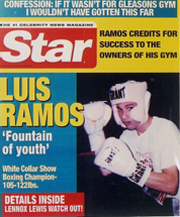 A ringside capsule of "club boxing" at a famous NY gym, featuring a bout with Louie Louie and a boxing champion. Luckily, Louie Louie survives. Seven diverse women explore the evolution of female sexuality and pleasure since the U.S. Women's Movement over 40 years ago. This film aims at encouraging elderly people in Hong Kong to treasure their lives and live bountifully. Joe Esteves (brother of Martin Sheen) interviews protesters during the Republican Convention in NYC. The camera in movement, shooting from above, black and white images which run with the same energetic rhythm of the music, busy following someone barefoot playing "innocently" a game with a grid drawn on the ground with chalk. But instead of the traditional grid, the chalk traces the shape of a molecule: the heroin molecule. The latest animated short from director John Cannizzaro ("50 Feet That Shook The World" 2004) is a dark satire of the history of the United States of America. African man, Kenya, tells a traditional Sonbura story followed by his account of going to primary school in Boragoi, Kenya. A cautionary tale about staying connected to the surrounding environment despite everyday distractions of modern technology. Obsessive layering and stylized video reversals come together to present everyday images of aesthetic beauty juxtaposed against images of a sometimes compromised and haunting nature. A personal record of one person's experience of a rather invasive medical procedure, and it's not always pretty. Mr. Bortin approaches this middle-aged rite passage with unblinking honesty, tempered with humor. Shelley's interplanetary romance, in a musical setting for two countertenors, with animated illustrations. "Subway" turns the public transportation experience into an expression of instinct, imagination & personal freedom. A short visual glimpse into an all night Bwiti ancestral worship ceremony of the Masango tribe in Southern Gabon Central Africa. Part of the Stand-Up Physicist series, half hour chats by Doug Sweeter about his theoretical physics research. This show tries to explain why quantum mechanics has to be the way that it is. A short film about a girl always trying to look good and be good, and always receiving bad luck... until she makes a realization. A package comes to the door containing a TV remote controller that can be used to control people. What would you do? Following Award Winners will be considered for future screenings.